Dermatitis (eczema/psoriasis) is a general medical term that describes various skin conditions that cause itching, blisters, redness, swelling, and often oozing, scabbing and scaling. Several skin disorders are named 'dermatitis', including atopic dermatitis, contact dermatitis, seborrheic dermatitis and nummular dermatitis, and all exhibit inflammatory symptoms. Because many dermatitis diseases are treated by topical steroids, such as hydrocortisone, they are often called steroid-responsive diseases. However, for some kinds of dermatitis with great severity, other treatments including immune function modulating drugs are used in part because of the use of steroids can worsen the symptoms for some of these disorders. Thus, it is important that the type of dermatitis be confirmed by a dermatologist in order to determine how best to treat it. The most popular suggestion for aiding this condition involves reducing the symptoms as much as possible to restore a healthy look and feel to the complexion. This is achieved through using a topical moisturizer specially formulated to care for red, inflamed, itchy prone skin, restoring normalcy and comfort. This is where ATOPALM comes in. Let us help you find the best skincare regimen for working with your skin! Atopalm Moisturizing Facial Cleansing Foam is an ultra-gentle, paraben-free foaming face cleanser designed for all skin types. Its light texture refreshes the face while efficient yet soothing ingredients lift and remove dirt, makeup, pollutants, and excess oils. Moisturizing Facial Cleansing Foam works without upsetting the skin’s natural pH balance, allowing you to cleanse without causing the skin to feel dry or tight. HOW TO: Moisten skin. Pump generous amount of foam into Palm of hand. Gently massage with a circular motion over the entire face. Rinse thoroughly with warm water. Pat dry. Repeat if necessary. Not to be used to remove eye makeup. 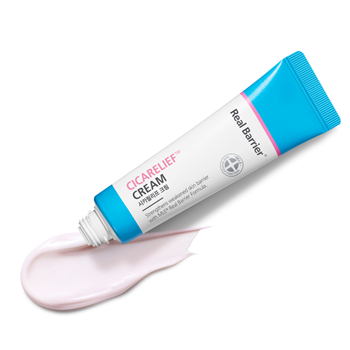 Cicarelief Cream soothes, calms and helps skin recover from external irritations… skin that has been compromised and requires “special care.” REAL BARRIER Cicarelief Cream is formulated with high concentrations of CALAMINE to help protect the skin from outside irritations, PANTHENOL to calm and MADECASSOSIDE to soothe. HOW TO: Use AM or PM after cleansing. Pat dry. Gently apply to irritated areas of the face or body until completely absorbed. Apply a thick layer to areas that need extra attention… red, scaly, itchy. Formulated without the use of parabens, this incredibly rich moisturizing cream is a gentle yet thorough way to replenish hydration. By mimicking natural skin lipids, it is able to replenish lost lipids while simultaneously preventing over-evaporation of the skin’s natural moisture. Finally, Intensive Moisturizing Cream shields the skin against the damage and discomfort associated with environmental stress, leaving the skin feeling fresh, soft, and perfectly comfortable. HOW TO: After cleansing, apply all over dry areas. Use as often as necessary, paying special attention to those stubborn, troublesome dry spots. This paraben free mask is infused with high concentrations of Panthenol 5%, Madecassoside and Allantoin to soothe and calm. And, of course Calamine Powder to help protect skin against irritation. This mask was developed for skin that has special needs…skin that has been compromised, is rough and prone to break outs. It is also an ideal mask to help remove excess dead skin and soothe a damaged skin barrier. 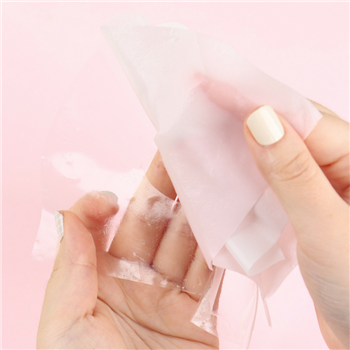 HOW TO: After cleansing, remove the mask from the pouch, it will be in two pieces. Peel the white film from the top section that is cut out for eye openings, apply to fit and then peel off the clear film. Repeat process for the lower section to be used around the mouth area.Relax 10 to 20 minutes while the mask is doing its’ work. Remove sheets and pat the remaining excess cream into the face. A gentle, refreshing face cleanser for all skin types. This gentle Gel Balm has a low pH similar to that of healthy skin and helps it stay balanced. Perfect for all over the face, post breakout treatment. As an additional benefit, it can also, with continued use, help brighten skin. A deeply moisturizing face cream for creating softer, suppler skin. A powerful anti-aging eye serum for younger-looking eyes. CICARELIEF CREAM MASK AN EFFECTIVE WAY TO TREAT DAMAGED, SENSITIVE AND IRRITATED SKIN.